Hello and welcome to my blog. It’s Sunday night already, where has the weekend gone? This week on CASEing the Catty we are CASEing from the Happiness Blooms section, pages 24-33. You may have arrived here from Rose’s gorgeous creation, thanks for continuing on with me. Make sure you visit all the Design Team’s Blogs by clicking on the “next” button at the bottom of each post. There’s lots of amazing projects in this section but this week I’ve decided to CASE the design on the tin from the Cute Crew Punch Box on page 32. The colours are Call Me Clover and Balmy Blue, two colours I wouldn’t normally have put together. For the background I’ve used the leafy stamp from Dandelion Wishes in Call Me Clover and the little flower is from Jar Of Love and is stamped in Frost White Shimmer Paint. I’ve punched a butterfly from the Botanical Butterfly DSP then added some Dazzling Diamonds to make it sparkle. The smaller butterflies are punched from Grapefruit Grove Foil Sheet. I’ve used some retired Black Metallic Thread for the butterfly antennas, they look so much better with antennas. The sentiment is from the Butterfly Gala stamp set. Hello and welcome to my blog. 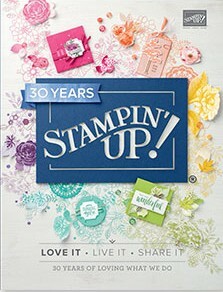 Today I’d like to share some #simplestamping with you, using stamps, ink , paper and Designer Series Paper (DSP). I’ve used Tropical Escape as my DSP and Botanical Bliss as my stamp set. The first card has a Granny Apple Green card base with a layer of Tropical Escape DSP. I’ve stamped the flower image from Botanical Bliss in Basic Gray straight onto the DSP. The next card has a Basic Gray card base and I’ve used the same stamp and colour to stamp the DSP again. The last card has a Basic Black card base and I’ve used Granny Apple Green to stamp my flowers. Each card has the same “Happy Birthday” sentiment on a quick and easy banner. 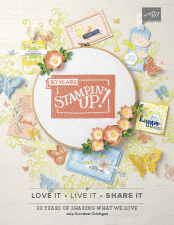 I hope you like my #simplestamping cards. Welcome to another CASEing the Catty Blog Hop. This week our inspiration is to CASE from the Sale-a-bration Catalogue. You may have arrived here from Lauren’s gorgeous creation, thanks for continuing on with me. Make sure you visit all the Design Team’s Blogs by clicking on the “next” button at the bottom of each post. Last week I got the Tea Time Framelits Dies as a free Sale-a-bration item with a $180 order so I was dying to use them. I’ve CASEd the card on page 17 of the Sale-a-bration Catalogue. I’ve used a Granny Apple Green card base with a frame of Blushing Bride die cut with the Rectangle Stitched Framelits. My Tea Pot has been stamped in Shaded Spruce on Tropical Escape DSP then die cut with the Tea Time Framelits. There’s a panel of Shaded Spruce behind the Tea Pot that’s been embossed with the Subtle Embossing Folder. My flowers are from Tropical Chic are are stamped in Blushing Bride with a touch of Flirty Flamingo in their centres. I’ve used the Sprig Punch for the leaves. I couldn’t stand throwing away the negative of my Tropical Escape DSP so I made another little card to match. Using my Stamparatus I stamped the Tea Pot neatly inside the Negative of the DSP. I also made another version of these cards using the Frosted Floral Specialty DSP.